The promotion and vernacularization of Hebrew, traditionally a language of Jewish liturgy and study, was a central accomplishment of the Zionist movement in Palestine in the years following World War I. 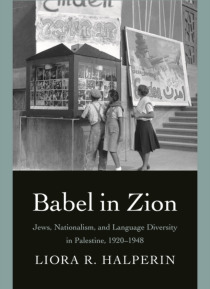 Viewing twentieth-century history through the lens of language, author Liora Halperin questions the accepted scholarly narrative of a Zionist move away from multilingualism, demonstrating how Jews … in Palestine remained connected linguistically by both preference and necessity to a world outside the boundaries of the pro-Hebrew community even as it promoted Hebrew and achieved that language's dominance. The story of language encounters in Jewish Palestine is a fascinating tale of shifting power relationships, both locally and globally. Halperin's absorbing study explores how a young national community was compelled to modify the dictates of Hebrew exclusivity as it negotiated its relationships with its Jewish population, Palestinian Arabs, the British, and others outside the margins of the national project and ultimately came to terms with the limitations of its hegemony in an interconnected world.